What might seemed to be a test car is now reality. Bajaj has launched a ultra low cost car the RE 60, this small baby is a four seater “quadricycle” and company is planning to release at least 5000 units in the first release. 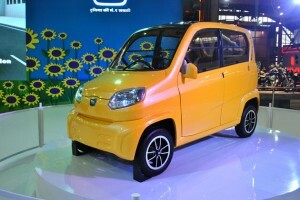 Although the auto makers Bajaj are still in progress to get a green light from the government, commercial production will only start after the government allows the product and gives them a safety clearance. The RE60 car is powered by a one cylinder petrol engine , and will provide a mileage of 35Km per liter. Bajaj is already known for its auto rickshaws but how will 4 people sit in such a small space seems like a puzzle to me. Already we have seen the degrading sales numbers of Nano. Which did not go as popular as people thought it would go wild. The car looks much smaller than the Nano and has interiors much like an auto rickshaw. The rear window is not made of glass but has a plastic cover . The car looks to have good ground clearance, the bumpers opens on the other side facing oppposite to the car. The car was first seen at the Auto Expo 2012 in Delhi. Where the auto makers decide to showcase their low carbon dioxide emission car. There is a fare meter included in the base model which makes us believe that they could be targeting the auto rickshaw market as well. The car weighs around 400kg and can reach a maximum speed of 70km/h. The car has been designed in cooperation with Renault and Nissan Motors. The rear space has been removed and added in the front like that in Nano. The car looks much like a toy car, but it is the sales which will decide the fate of it.